I love TOMS Classics. To date, I own 7 pairs. Yes, you read that right -- 7 pairs. (Those are my silver glitters, above.) They're super comfortable, they come in tons of colors and patterns, and they just make every outfit that much cuter. Plus, for every pair you buy, TOMS donates a pair to a person in need. And today, one winner has the chance to receive his or her very own pair of TOMS Classics! This giveaway has a retail value of around $54. Here’s how to enter. 2) Like The Beauty of Life on Facebook and leave a comment on the Facebook post about this giveaway telling me why you want to win a pair of TOMS. This giveaway ends on Sunday, December 16 at midnight. One winner will be chosen AT RANDOM on Monday, December 17. Maximum of FOUR ENTRIES (one for each way listed above). Multiple entries will be disqualified. Giveaway is open to US residents only. I want to win the Toms' Classics Women's "Multi-Glitters" shoes - I've been eyeing them for weeks and hoping that they might show up under the Christmas tree! 3. Already following you on twitter - and I tweeted about the giveaway. Love the Grey Dot Women's Toms - I LOVE these shoes! They would match a lot of the clothing that I own, and they look so comfortable (and are such a great cause). This giveaway is great! Thanks! Totally loving the Multi Women's Glitters! I would get the Ash University Rope Sole Classics! I love TOMS. They are great for walking around campus. I love TOMS! These are spectacular! Thank you, TOMS, for helping others! So many choices. Ash uniiversity navy rope sole for the moment . . .
Love the Ash Canvas Women's Classics! I like the Wine Canvas ones! Love the ash university stripe rope sole - what a great giveaway!! Thank you for this fabulous giveaway! I've always loved the Black Glitters. Cannot resist a little glitter. :) Merry Christmas! 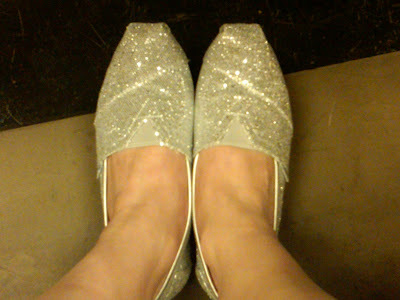 I would love to win the "Snow Leopard Women's Vegan Classics" Toms please. Oh, SO difficult to pick a pair! I'd love to go with the Purple Dot Women's Classics. Thanks so much for offering this terrific giveaway! Oh----very pretty...I love the glitter! Would love to win the Snow Leopard Women's Vegan Classics. I've been dying for a pair of Tom's. At first I thought I'd want a solid black. But I'm loving the herringbones as well as the grey pop cord. OBSESSED!! Every since I first heard and saw about Tom's, I quickly became obsessed! lol who's with me on that one?? ;) REALLY hoping about winning this one! or two? hehe HAPPY HOLIDAYS EVERYONE AND GOOD LUCK!! I want to win the Red Dot Women's Classics! Love them so much. I love the ones in the picture!! Gilded Herringbone Women's Classics look super cute! I'd like the gilded herringbone! :) thank you! I love the black glitter classics! Thanks for the contest! 2. I left a comment on facebook as well. 3. I also tweeted about this giveaway!